Police are appealing for witnesses after a car collided with a group of pedestrians on Saturday night (September 9) leaving two men dead. A police spokesman said: “Just after 8pm on Saturday (September 9) a Nissan Pathfinder 4x4 driving north east collided with several pedestrians who were in a group walking along Harveys Lane, just off the B2192 outside Ringmer, East Sussex. “Tragically two of the pedestrians, a man from Wimbledon, south west London, and a man from Tunbridge Wells, both aged 31, died at the scene. “Two women, a 29-year-old from Wimbledon and a 27-year-old from Addlestone, Surrey, were treated for minor injuries at the Royal Sussex County Hospital in Brighton and were discharged. “The other three pedestrians in the group – a 29-year-old man from Addlestone, a 24-year-old woman from Morden and a 31-year old woman from Sutton, both in south London, were unhurt. The East Sussex Fire and Rescue Service was also called to the scene. A spokesman for the service said: “East Sussex Fire and Rescue Service were called to Harveys Lane in Ringmer at 8.13pm on September 9, 2017. “Two fire engines and an officer were sent to the scene. 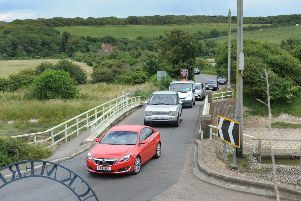 “South East Coast Ambulance Service and Sussex Police were also in attendance. Assistant Chief Fire Officer Mark O’Brien said: “This is clearly a terrible time for the families and friends of those who have lost their lives. “We do not know precisely what happened – the exact circumstances are being investigated.